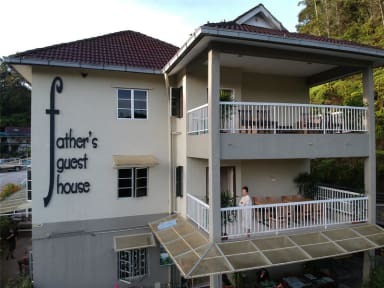 Tucked away in a quiet location just off the main road, Fathers Guest House is a three storey bungalow and one of the most popular choices for Backpackers & Budget Travelers. 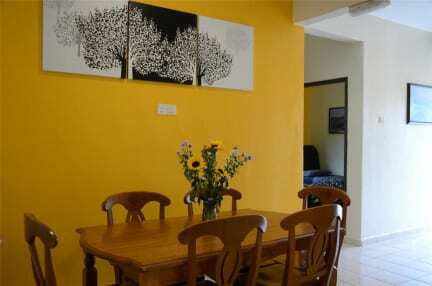 Clean rooms, friendly service and ideal location makes this THE place to stay. Come and meet like minded travelers, share a beer, and all your adventurous travel stories. We are located 5-minute walk from the bus station in Tanah Rata (just 200 meters from Main Street, opposite Maybank ) about 2 kilometers to some of the famous tourism spot in Cameron highlands such as Cameron Valley Tea Plantation, MARDI Agro Park, Orang Asli Village(Aboriginal Village) and Strawberry farms. Awesome Place, we just love it!!! Great place to stay if you want to discover Cameron Highlands. Breakfast is not included but they have a cheap breakfast menu with big variety. 2 private rooms share one bathroom. We would stay here again! Wir waren zu zweit in einem Doppelzimmer und es hat uns sehr gut gefallen. Das Zimmer war in Ordnung und sauber. Die Mitarbeiter sind super freundlich und helfen einem. Das Frühstück neben an ist super und günstig! Good location and nice staff. Tours can be booked there. The "Mossy Forest Tour" is good if you are too lazy for a hike. Breakfast next door is good but slow. However, only 2 bathrooms per floor are not enough and the floor was always wet. Also no shoes allowed in the hostel. It is not really a hostel. No fridge, no kitchen. Also there is one bathroom for 10 people. The shower doesn't have a curtain, so the toilet is always wet. Not much toilet paper. It is an OK hostel for 2 nights but not more. The tour we booked through them was really good.